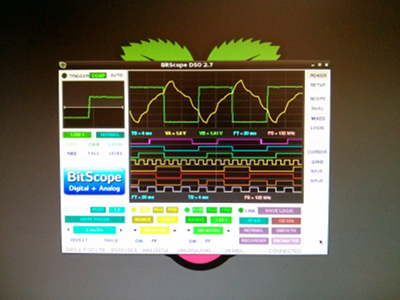 BitScope In Education | Electronics and programming for the real world. We would like to see to priority given to the fields of Science, Technology, Engineering and Mathematics (STEM) in school education. We believe it's vital to equip the next generation with the skills they need to master a world dominated by technology and enable them to address the challenges they will face during their working lives. Our particular focus and expertise is in programming and electronics. BitScope has long been involved in the education sector with mixed signal test, measurement and data acquisition solutions for use in universities for students, researchers and educators. With BitScope Ed we seek to broaden this to include resources for primary and secondary school education. We have been impressed with the rise of the "maker culture" where an increasing number of people have become empowered to engage in home grown engineering inspired projects in the fields of electronics, robotics and bespoke manufacture such as 3-D printing among many other creative pursuits. Maker culture puts the focus on creative and collaborative problem solving, computer programming, shared design and open source hardware and software solutions. We believe these are just the characteristics required for effective education, especially in STEM fields. Our contribution to this movement for changes in education is focused on electronics and programming for the physical world. An education in electronics and programming can be very engaging and a lot of fun with low cost systems like Raspberry Pi or Arduino, some simple electronic components, prototyping boards and BitScope. This is the platform idea behind BitScope Ed. We've established the BitScope Blog for general information about BitScope and we've added the Education Blog where we are posting updates we hope will be of interest to students and educators. We started the Raspberry Blog for makers working with embedded computers, robotics, electronics, sensors & servos and we've used ideas from this to build a low cost electronic projects lab to host some educational tutorials based on Breadboard One. If you're a teacher looking to set up a practical electronics course or a student wanting to see how your circuits actually work, a low cost all-in-one setup like this can save a lot of time and effort. We believe learning to program should be a part of every student's education. Seymour Papert first coined Computational Thinking as the name for a new approach to problem solving and learning. Google and others are building on the idea in educational contexts. At BitScope Ed we are working with others to develop learning platforms and curriculum resources that combine programming with project based electronic systems. We've seen first hand just how engaging some similar educational programs can be for students of all ages and the huge response from parents, students and educators to our recent exhibit at the Sydney Mini Maker Faire reinforced this idea. We see (computer) programming as an effective way to develop good problem solving skills. Computers are everywhere. We use them every day, from mobile phones and tablets to PCs, TVs our cars, homes and work but few people actually know how to bend them to their will, i.e. how to program them. Fewer still know how to solve complex problems to build and program practical and scalable solutions. We believe this is because these skills are not part of most students' education in many countries including Australia. In recent years Raspberry Pi and Arduino have done great job lifting the veil on what computers are and what one can actually build with them. They are effective low cost platforms for learning programming and electronics. In the context of project based learning with BitScope they become very powerful because students can see inside their projects and understand how they work, or why they don't work as expected! Project based learning where problem solving skills are developed through learning how to program "real computers", build actual electronic projects and see how they work is the key motivation for BitScope Ed. We can't do it alone of course! We'd like to combine this with shared online and interractive curriculum resources and integrated remote and local access to the lessons and projects. We welcome all feedback, ideas and suggestions for collaboration! For all the latest news, updates, tutorials and more you can read all our recent blog posts online, subscribe to our news feed or follow us on Facebook, Google+ or Twitter.